Mukesh Ambani created a lot of buzz earlier this year when he announced that his new company Reliance Jio Pvt Ltd will be providing unlimited 4G data to all its users for the first 3 months of its initial launching under their 'Preview Offer'. To a country like india where data prices are so high, this announcement came as a breath of fresh air and soon enough almost all 4G mobile holders started availing this offer. Although after sometimes of its launching as the number of users began to grow and the load on the company's servers started increasing, the Internet speed started diminishing. Now at a time where most of the 4G Mobile holders have gotten their Jio sim cards and are enjoying the renamed free Welcome offer from the company, the speed of Internet has came down to a point where at many places even other 3G networks are providing faster Internet speed than the mobile network dubbed as the 'True 4G' network. How to Increase Reliance Jio 4G Speed? Step 1. Open Settings on your phone and click on more. Step 2. After you click on more, a new window shall appear, find and click on Mobile Networks from there. Step 3. Click on Access Point Name from the menu that appears. If your phone is dual sim, you'll see options for choosing APNs fire both sim cards. Select the sim slot in which you have put your Jio sim card. Step 4. Now choose Menu from the top right corner and select New APN. Step 6. After you save the above given data, select your newly created APN settings and you're done. Now you are ready to use the Internet with your new APN settings, restart your phone and then enjoy increased jio 4G speed. This method is risk free as if you face any problems you can always restore the original settings by going back to the APN menu and selecting the Reset to Default option. Every Server has limited bandwidth also known as the amount of data a server can process at a time. So when too many people try to connect to the same server, the bandwidth is distributed among all of them and the Internet speed for each user comes crashing down. Step 1. Download Snap VPN app from Google Play Store by clicking here. Step 2. Now connect to Internet using any web browser and try to download and file. Check the download speed for the file and then minimise the browser. Step 3. Now open the Snap VPN app we downloaded and connect to a VPN from any country. Once the VPN is connected, check the download speed once again in the browser. You should notice a increase of 10-20 MB in the speed. If the speed does not increase then you can try to connect to any other country's VPN using the same steps and check results. If the results remain unchanged then we suggest you to try using any other VPN app from Play Store. 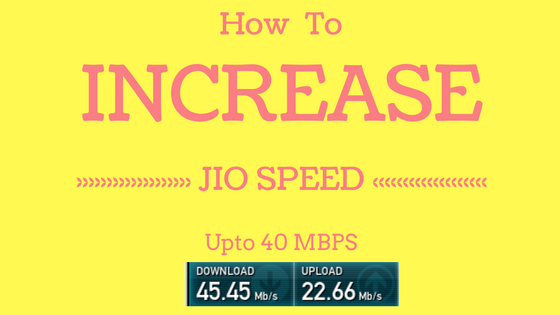 If the above given methods to increase Jio 4G Internet speed does not provide you satisfying results, then we have one last trick for you which can help you in increasing Jio 4G speed. However before moving on, we would like to warn you that this method will help you to accuire better internet speed but will make your 4G coverage unstable. So try this method on your risk. Coming to the trick, we all know that Indian cellular network providers currently provide 3 different types of connectivity options to use Internet dubbed as 2G, 3G and 4G and each one of these technologies have different coverage and gives different Internet speed. However, what most of us don't know is that even these networks have different strength quality known as bands. In India, there are 3 bands that are currently used to provide 4G Internet connectivity by Jio. Each of these bands known as band 5, band 3 and band 40 provide different Internet speeds. Among these, Band 40 provides the highest Internet speed but is weak on coverage side, and band 5 provides the best coverage but less Internet speed. By default, our phones are set to change the Bands automatically to keep you connected to the Jio network regardless of your location. The catch is that this often results in lower Internet speed. Step 4. Now Select 2263 from the listof codes, and press Launch 0. Step 6. In the Band selection screen, select “LTE” and select LTE_40 from the list instead of LTE_3. Step 1. Download MTK Engineering Mode app from Play Store. Step 3. Finally select the Band 40. Once you have selected your preferred band, restart your phone and you are ready to enjoy the faster Internet speed. Step1:First download UC mini browser from Playstore. Step3: Now download and open snap vpn from playstore. Step 5:After connecting it to indian server, Resume the download file and check your internet speed. These were the best tricks for increasing Jio internet speed,jio 4g internet speed,jio Internet speed hack,how to increase jio internet speed in Iphone on Reliance Jio Sim cards. If you face any problem while using these methods, do let us know In the comments box. Thanks for this informative post. I also use Jio but there is no network in our area. Thanks for the amazing tips you shared with step by step.